Generous donations received… grant funding secured…community and political support gained … and a long-desired goal can now be reached! An accessible, expanded, updated Valley Falls Free Library!! What’s happening? What changes will occur? An expansion! The new design includes an attached addition behind the existing structure, effectively doubling our footprint (we’re playfully calling it “Seeing Double”). Key features include expanded children’s activity, technology and community use spaces, and a new main entrance accessible to all on the Lyon St. side (facing the post office). 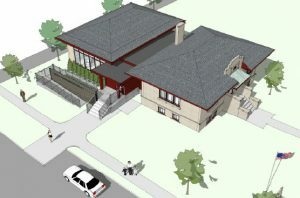 The design, roofline and construction elements have been approved by the State Historic Preservation Office and will complement and mimic the historical aspects of the existing building. The existing entrance will be kept as a secondary egress. The war monument, flagpole, bike rack and historical marker will remain as they are. Grant monies received so far can only be used for construction purposes, so we’re launching a Capital Campaign that will assist us well beyond the physical expansion. Your donations will be used to support the purchase of new interior furnishings, additional media and books, upgraded technology and other items needed in our overall space. Your support will make it possible to continue to grow and expand our community services into the 21st century: youth, adult and community programs, computer and internet access and so much more. Campaign details coming soon! Secure the necessary permits and approvals from governing municipal bodies. * Continue to utilize the services of our all-volunteer building committee working with our architect. begin no later than early 2019. 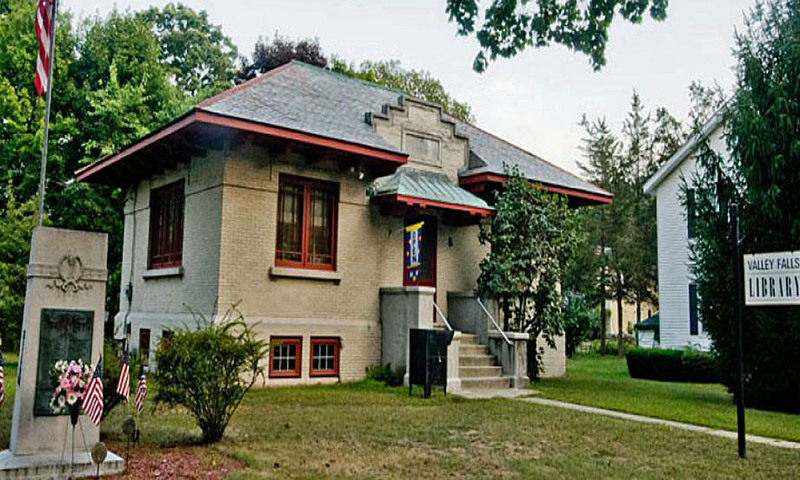 To date, the Valley Falls Free Library has secured funding for this building project from several sources: an award of State Aid for Library Construction from the 2018 State Budget; a generous gift from the Johnsonville Volunteer Ambulance Service; Bullet Aid grants allocated by Senator Kathy Marchione; prior fundraising activities in support of an accessible library; and other generous gifts and grants from community partners, as well as patron donations from friends of the library. See the timeline below for further details on our fundraising efforts to date. The funding for this expansion project has been secured independently from the library tax. The only way the library tax can be increased is via a proposition and with voter approval. The Valley Falls Free Library is initiating a Capital Campaign soon in order to obtain additional funding for furnishings, media, resources and other operational budget items. How long will the project take, and could there be closures? The construction timeline is dependent on many factors but is anticipated to be completed within one year. The building committee will work to ensure that closures (if any) are kept to a minimum. Many years back: The library board engaged in an ongoing struggle with the building’s lack of accessibility; they conducted fundraising and drafted architectural plans for an addition that ultimately the library could not afford. Since then: The board frequently revisited the issues of accessibility and stairway disrepair; considered a ramp out front, a ramp out back, new electric doors, etc. Viability issues persisted – space, historical aesthetics, and cost. Fall/Winter 2016: Johnsonville Volunteer Ambulance Service (JVAS) was disbanding and sought a way to disburse their remaining funds in accordance with their charter. Spring 2017: The VFFL realizes significant grant monies might be available for an expansion and “ramps up” efforts. Summer 2017: JVAS decides to donate $100,000, the bulk of their remaining resources, to VFFL. The board charters a building committee, which engages an architect, Neil Pelone of Troy, and generates construction plans. Based on that work the board submits a NYS Library Construction grant application. Summer 2018: NYS Attorney General completes review of the JVAS donation and approves; the donation comes to VFFL. The UHLS and the State Education Dept complete their reviews of our grant and give full approval. VFFL receives the construction grant in late August. The JVAS donation, when combined with the NYS grant, will allow our long-sought vision to materialize. We are extremely grateful for the JVAS legacy of community service and dedication. Their years of hard work and fundraising created this generous gift. We’re using their gift to honor and continue that legacy. Previous PostPrevious Story Time is Here!! Next PostNext The Valley Falls Free Library Expansion Fund Drive Starts Now!